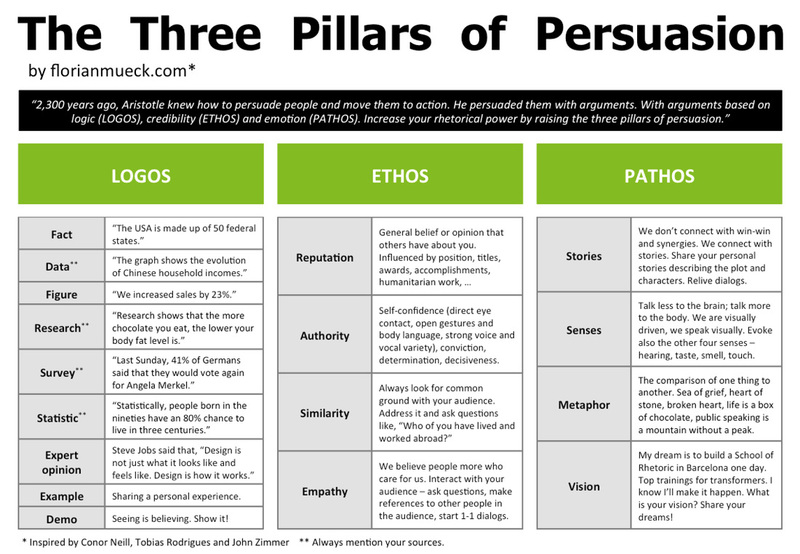 Aristotle’s "ingredients for persuasion" – otherwise known as "appeals"
They are all means of persuading others to take a particular point of view. someone of the character or credibility of the persuader. audience of an argument by creating an emotional response. Logos is an appeal to logic, and is a way of persuading an audience by reason. Socrates: A big-city philosopher in ancient Athens. Accused and convicted of corrupting the youth, his only real crime was embarrassing and irritating a number of important people. ​Famous quote: "The unexamined life is not worth living." of the soul in a body. ​Famous For: Writing the treatise "The Republic" on the ideal society, in which he expressed the thought that a philosopher, of all people, should be king. probably the highest paid philosopher in history. Aristotle started his own philosophical school when he was 50 years old. Although he lived only ten more years, he produced nearly a thousand books and pamphlets, only a few of which have survived. This great thinker was called a peripatetic philosopher because he liked to lecture to his students while taking a walk. Another group of philosophers were called stoics because they preferred sitting around on porches when they shot the breeze. A key theme in Aristotle's thought is that happiness is the goal of life. He decided to go into exile when conditions in Athens became a little politically dangerous for him, in his words, "...lest Athens sin twice against philosophy". ​Famous For: The founder of logical theory. Aristotle believed that the greatest human endeavor is the use of reason in theoretical activity. One of his best known ideas was his conception of "The Golden Mean" (to avoid extremes) which is the counsel of moderation in all things. ​which is a part of critical thinking. Is someone trying to convince you of something? What are they trying to convince you of? Why do they think you should believe them? ​A fun Monty Python parady video regarding argument strategies. In addition to exploring Critical Thinking through the lens of persuasion, it is important to understand critical thinking's relationship to clarity. As such the basics of logic in argumentation are important to understand. These concepts include definition, assumption, relations, and common logical fallacies. Below is a link to download a PowerPoint containing a brief lecture delivered to the Capstone class on these subjects. An exploration of symbolic logic leads naturally into some basic concepts in epistemology. Most modern explanations are rooted in some form of empiricism. Underlying the theory of empiricism is (often) the idea of Correspondence as a measure of truth. The correspondence theory of truth holds that our language of explanation is truth if its objects (words) and rules of it's relations correspond to the real world. This common epistemological view underpins the importance of consistency in concepts and the linguistic expressions that compose arguments. It also however introduces us to the issue of skepticism about explanations, and the issue of constructionism in categories.